﻿Bruce Goodman's "Gored by a bull"
It’s been an utter tragedy. The whole village is in shock. Harry Dennison has been gored to death by his bulls. If anyone knew how to handle bulls it was Harry Dennison. Harry had bred and handled bulls for a good fifty years. He’d started out with just the one cow and bull, and now it could just about be said that every bull in the county was from Harry’s stock. I suppose you could say that being gored to death by bulls is a fitting enough finale to such a (excuse the pun) bull studded life. But the shock of it all. It’s going to affect the whole area. It’ll be a huge funeral. And getting gored by out of control bulls must be the goriest thing you can imagine. Those horns will rip open a man’s chest and stomach before you can blink. And the foot stamping on the head. And the tossing. 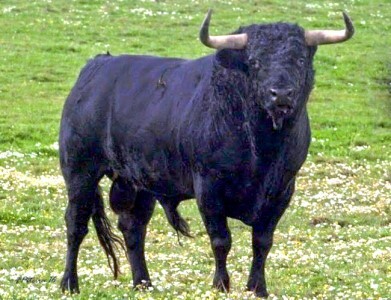 And a bull doesn’t give up; one whiff of blood, for a mad bull in a mood, and you might as well kiss your arse goodbye. Gored to death. I’m sorry to keep repeating it, but I’m profoundly shocked. Shocked. What’s that? Oh! Oh dear. Harry Dennison wasn’t gored to death by bulls at all. All he said was that after fifty years he’s bored to death by bulls.